For the ultimate golf break in Kent, stay in five-star luxury in the accommodation at Hever Castle and play our 27 hole Championship Course, which forms part of the Hever Castle Estate, offering a truly inspirational setting for a golf break. Golf and hospitality have been an integral part of the Estate’s history and today we preserve these traditions and deliver a memorable experience to all who visit. The course is set in 250 acres of truly beautiful Kent Weald countryside, nestling in the River Eden Valley, below the hills that border Kent, Surrey and Sussex. With its abundance of natural riches, Hever Castle golf course has been constructed to be in complete harmony with the picturesque setting and each hole has developed its own distinct character. All levels of experience are welcome from beginners to experienced players. The club professionals at Hever play a very important role, bringing together considerable knowledge of the game, specialist advice and skills that help golfers enjoy the game and realise their ambitions. Stay just 1 mile away from the Golf Club in five-star luxury. For experienced players – 18 Hole Championship Course. For new to the game/short of time – 9 Hole Intermediate Princes Course. Extensive Practise facilities including driving range & putting green. Castle Golf School – 3 Professionals for any levels of teaching requirements. Fully stocked Professional Shop – items to buy or to rent (buggies/trolleys & golf clubs). A unique Tudor style clubhouse at the golf club, home to the Astor Lounge Bar & Restaurant which offers a friendly and welcoming environment serving lunches daily. The present-day Championship Course comprises the Kings and Queens Nine, created in 1922, this course was further complemented by the creation of the Princes 9 holes course in 1989. Our dedicated team of coordinators will make all the arrangements necessary to make golf part of your experience when you stay at Hever Castle. Within the estate grounds, there are two options for your stay at Hever Castle. 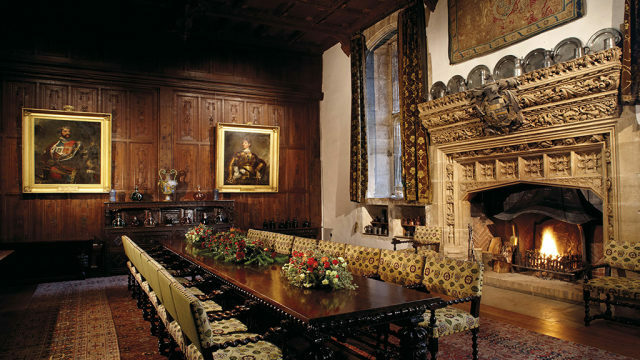 One is as a guest in our ‘five-star’ luxury Bed and Breakfast, which is located in the Astor Wing and the Anne Boleyn Wing. The other is in our ‘five-star gold’ rated holiday cottage, Medley Court. Golf Breaks are available in line with Bed and Breakfast lead in times whereby bookings can be taken up to six months in advance for Anne Boleyn Wing accommodation and eight weeks in advance for Astor Wing accommodation. Medley Court is available to book on a week by week basis, or a minimum of two nights stay can be booked for short lead bookings, eight weeks in advance. Prior to playing at Hever Castle Golf Club a number of our party took advantage of the Hever Castle Luxury Bed and Breakfast accommodation on offer a mile from the golf club. The rooms were simply magnificent and splendidly equipped. My wife and I were in a feature room with a Four Poster bed, very grand. We stayed two nights and were then able to look round Hever Castle and grounds on the 31st March. Beautiful is the only word to describe both. Loved the whole experience of the Accommodation and Golf Course and will be back soon.